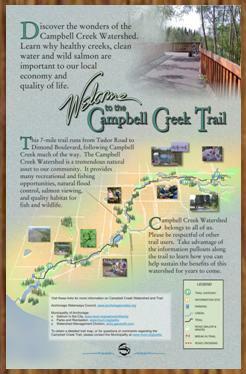 Discover the wonders of the Campbell Creek Watershed. Learn why healthy creeks, clean water and wild salmon are important to our local economy and quality of life. 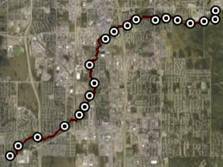 This seven-mile trail runs from Tudor Road to Dimond Boulevard following Campbell Creek much of the way. The Campbell Creek Watershed is a tremendous natural asset to our community. It provides many recreational and fishing opportunities, natural flood control, salmon viewing, and quality habitat for fish and wildlife. Campbell Creek Watershed belongs to all of us. Please be respectful of other trail users. Take advantage of the information pullouts along the trail to learn how you can help sustain the benefits of this watershed for years to come. To obtain a detailed trail map, or for questions or comments regarding the Campbell Creek Trail, please contact the Municipality at www.muni.org/parks.